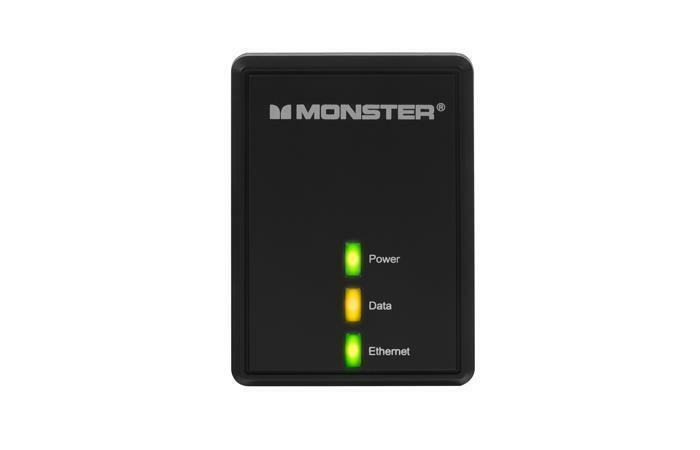 Monster’s line of surge protectors include everything you need to connect a network device using your home’s electrical wiring. When Wi-Fi can’t handle your streaming media needs, a wired network often can—and to avoid the trouble and expense of installing ethernet cables, you can buy powerline network adapters that send data over the existing electrical wiring in your home. But most of these products only perform well when plugged directly into a wall outlet: Surge protectors and power strips, which are designed to clean up electrical signals, can degrade data throughput. Monster Power Black Platinum surge protectors address this problem by offering built-in powerline networking support in addition to support for cleaning electrical signals on coaxial cable, two USB charging ports, and six, eight or 12 outlets that are priced at $170, $200, and $220 respectively; we reviewed the eight-outlet model 800. (You can find all versions on Amazon at a slight discount.) 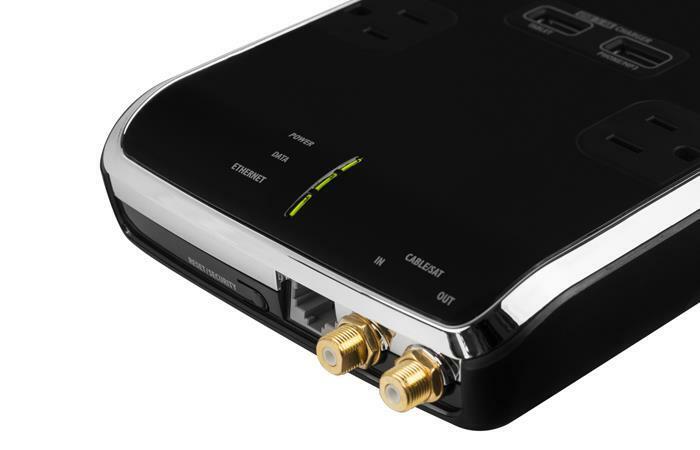 The networking functionality (like that of most powerline products) is set up by plugging a small adapter (included) into a wall outlet near your router and connecting it to one of your router’s open LAN ports. You then simply run a cable from the Black Platinum’s ethernet port to the device you want to add to your network. Or if you want to connect multiple devices in the same general area, you can plug it into an ethernet switch and connect those devices to the switch. The benefits of using a Black Platinum (as opposed to dedicated powerline networking adapters) include access to multiple surge-protected outlets from a single wall port. If you have streaming media devices in more than one location, you can add additional Black Platinums to extend the size of the network. Plug this adapter into a power outlet near your router and connect the two with an ethernet cable. 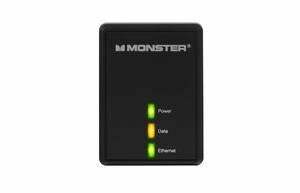 Unfortunately, you won’t be able to build out the network with powerline-networking products from any other vendors, because Monster didn’t adhere to any powerline networking standard. And since Monster does not offer stand-alone adapters, you’d need to buy more Black Platinums even if you don’t need the additional power outlets. Also, the bandwidth of Monster’s powerline network is considerably slower than those based on the latest HomePlug technology, HomePlug AV2 MIMO. In our tests using the JPERF benchmark to measure TCP throughput, Monster’s network delivered a fraction of the performance that the Extollo LANSocket 1500 (the fastest HomePlug AV2 MIMO adapter we’ve tested so far) provided: 50Mbps per second, compared to more than 350Mbps. In fairness, the lack of support for the HomePlug standard isn’t as much of a drawback as it sounds, because the HomePlug AV2 MIMO products we’ve tested don’t perform at anything close to their top speed when paired with adapters from different vendors. In other words, you’re better off buying all your powerline-networking hardware from a single vendor anyway. 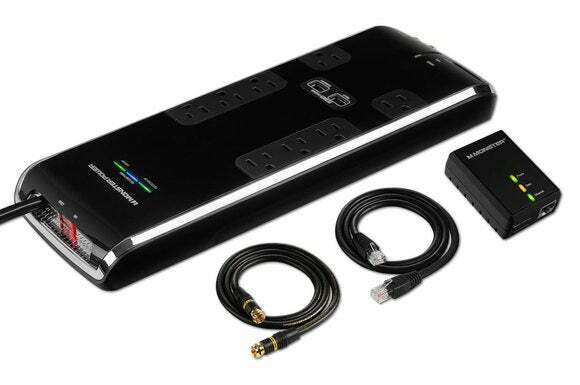 The Monster Power Black Platinum surge protectors can also protect your cable or satellite set-top box from power surges. Be that as it may, the Monster Black Platinum’s relatively slow speed could become an issue in homes where multiple users are streaming high-definition video over a powerline network. Netflix, for example, recommends bandwidth of 25 megabits per second for 4K Ultra-HD streams, compared to just 5Mbps suffices for 1080p. But if some users are able to use your Wi-Fi network, reserving powerline for use in dead spots where Wi-Fi signals can’t reach, that might eliminate contention on the Monster network. Monster markets the Black Platinum line as surge-protection devices first, and a modern entertainment center can certainly use the protection it offers for multiple devices. If you don’t have enormous bandwidth requirements—in other words, if Wi-Fi meets most of your high-speed networking needs, but you have a Roku, Amazon Fire TV, or Apple TV stuck in a dead zone—Monster’s dual-purpose solution is worth considering. But if you need a wired high-speed network that can reach multiple locations, and don’t want to fish ethernet cable through the walls—HomePlug AV2 MIMO is the technology you should reach for. Just don't plug those adpaters into surge suppressors. The Monster Power Black Platinum is expensive for a surge suppressor, but the powerline-network feature sets it apart from the competition—even if it is much slower than HomePlug AV2 MIMO adapters.